Get your free coupon deal from P.F. 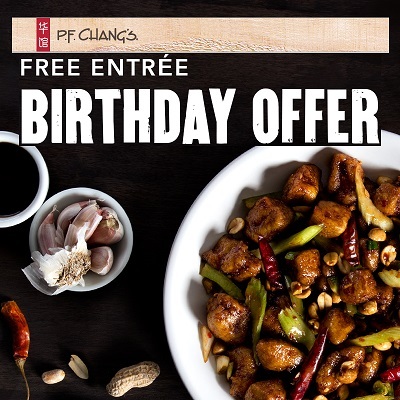 Chang’s just sign up to get a FREE Entrée’ of your choice with the purchase of an entrée coupon. Click for the free P.F.Chang’s birthday deal and in 24 hours you will get an email with the coupon valid for 45 days. Hot Tip: I don’t always use my actually birthday for every birthday freebie otherwise it’s too many freebies all at once. I use our anniversary for some and a random month for others to spread out the free stuff!! See more FREE On Your Birthday Deals!